The Bukimisha Weird Secret Society returns with a captivating tribute to Akira Ifukube's MAJIN scores. The CD features the group's a cappella treatment of cues from all three films in the trilogy, DAIMAJIN (known as "Majin, Monster of Terror" in the U.S.), WRATH OF DAIMAJIN ("The Return of the Giant Majin") and RETURN OF DAIMAJIN ("Majin Strikes Again"), all released in 1966. The series takes place in feudal Japan, and each chapter chronicles the mythical stone warrior-god Majin coming to life to avenge acts of human cruelty, usually inflicted by a power-mad warlord or local tyrant. Despite the films' repetitive storylines it is always a thrill to see the enraged giant wreaking righteous havoc, and giving the featured villains their just desserts. 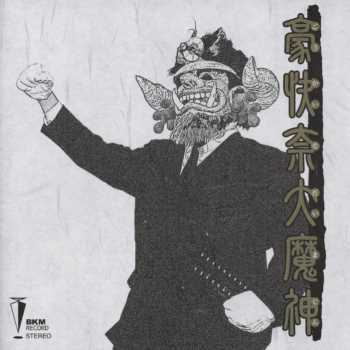 Fittingly, Ifukube contributes some of his most ominous and haunting film music ever, and GOUKAI Na DAIMAJIN does a fine job of capturing its feeling and power, while simultaneously retaining Bukimisha's trademark sense of fun. Majin's theme, which is heard in various forms throughout the series, is a relentless, dirge-like march; its ominous strains are heard whenever the monstrous deity appears. Bukimisha's versatility and inventiveness are especially evident in this piece, as each version is given a fresh vocal arrangement. Perhaps the most impressive example is "DaiMajin's Fury" (Track 8), a spectacular aural manifestation of the god's unstoppable onslaught. Another recurring theme is the sad, plaintive "Prayer of Kozasa" (Track 6), which effectively evokes the hopelessness and despair of the village's downtrodden inhabitants. This theme also serves as the first film's touching end title (Track 10), and shows up again in the first sequel (Tracks 12 and 15). Other notable themes include "Escape" (Track 4), a swirling, suspenseful motif punctuated by haunting vocal harmonies. The piece briefly reappears in altered form in "Blowing Up The Statue of The Martial God" (Track 13), where it soon morphs into another version of Majin's theme. The stately "Oppressed People" (Track 5) actually reprises an earlier Ifukube cue, the intro to 1962's THE WHALE GOD. Needless to say, Takeo Yahiro and friends give it the royal treatment here. The third film's end title (Track 27) is particularly somber and moving, with rich, multi-layered vocals weaving a sad, final goodbye. The music on this CD is interspersed with occasional snippets of Japanese dialogue, which is likely associated with the films themselves. As with most Bukimisha CDs, the main cues are followed by a selection of bonus tracks featuring additional dialogue and music. Those of us who don't speak Japanese may never know if these brief vignettes relate to the group, the CD or the films - perhaps all three? One of the downsides of listening to the Majin soundtracks is their somewhat tedious repetition, due to the sparse number of themes employed. To some extent the same holds true for Bukimisha's disc, though again, the group does an impressive job of varying the vocal arrangements and emotional range to mirror the original cues. If nothing else, the repetition is certainly hypnotic! The original soundtracks have only sporadically appeared on compact disc. The most comprehensive presentation is the 2-CD COMPLETE RECORDINGS: AKIRA IFUKUBE DAIEI SFX FILM MUSIC on the Futureland label (1988, reissued 1992), which features all three Majin scores in their entirety. There is also an excellent 1995 single-disc compilation of musical highlights from the trilogy on Columbia (COCC-13080), as well as a 2007 budget reissue of a 1981 Columbia LP (COCC-72240). In addition to its musical qualities, GOUKAI Na DAIMAJIN's packaging is nicely designed, with inserts elegantly printed in black and gold on textured rice paper. The CD is a fine companion piece to any of the aforementioned soundtrack sets, and highly recommended to Ifukube fans as well as those who have enjoyed Bukimisha's past efforts. As with previous CDs in the series, this disc can be ordered directly from the artists. Visit their English web page at: http://www.bukimi.com/maal/hanpu_english.html, or email Takeo Yahiro (yah@bukimi.com) for more information.